Blaik, a member of West Point’s Class of 1920, was known as “colonel” because he retired at that rank in the reserves. 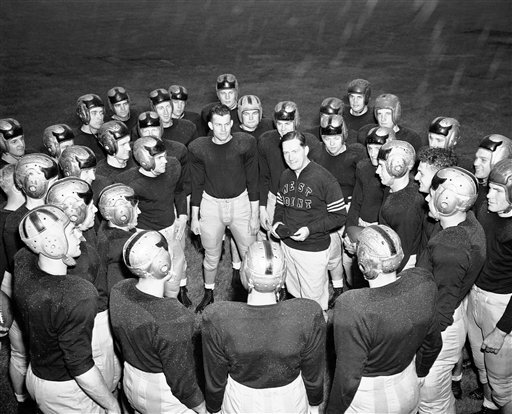 As a civilian, he coached the Cadets to a 121-33-10 record over 18 seasons, from 1941 to 1958, included three national titles. He coached three Heisman winners. He mentored an NFL legend. He led a struggling, undermanned program through World War II and into national prominence. And he survived an honor-code scandal in 1951 — involving dozens of players, including his son — that makes it clear the sports-vs.-academics issues faced by service academies and other colleges aren’t unique to recent decades. His only losing season came the year the scandal broke. The Colonel died in 1989, at age 92. In 1999, the field at Michie Stadium was named for Blaik. Read more about him here and here.